Kelly Reynolds and Chad Falkenberg of Falken Reynolds. 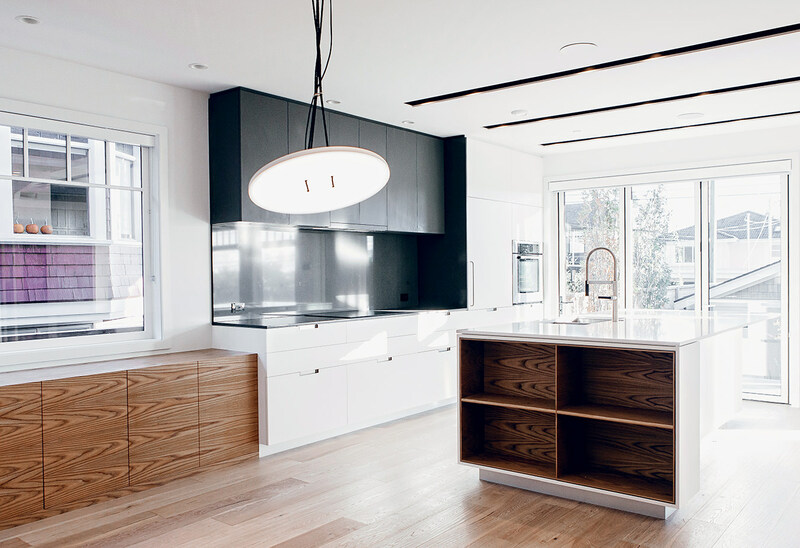 Interior view of the MacDonald Park house kitchen. A vertical oak screen provides privacy from the kitchen while maintaining openness on the first floor of the house. 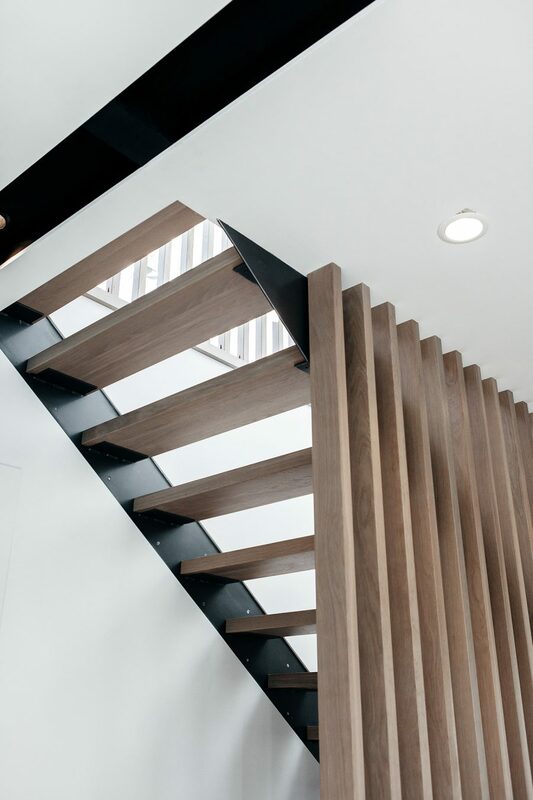 Open stair treads play with the vertical oak screen and create a range of visual transparency from above and below. A light but varied palette of woods adds texture and depth to the space: oak floors and screen, an elm panelled door, and a teak bathroom vanity. 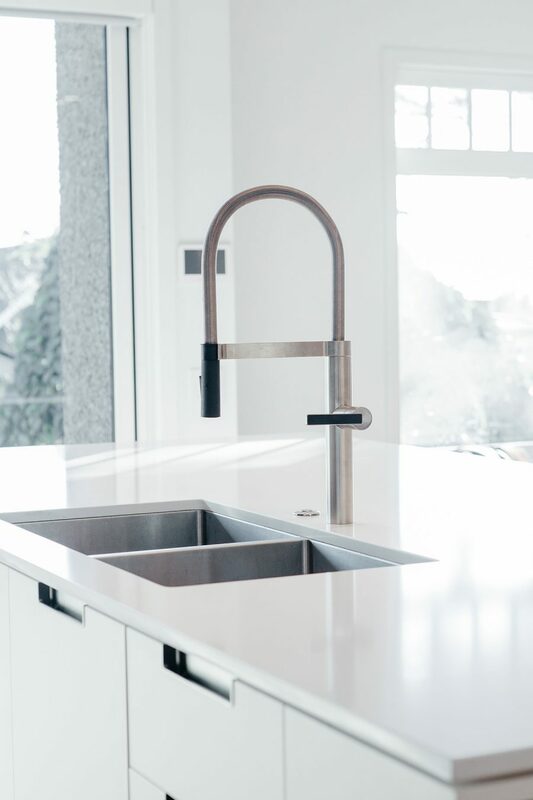 Flush cabinet pulls, quartz counters, and a pull-down faucet were all necessary considerations when designing for a young, active family. 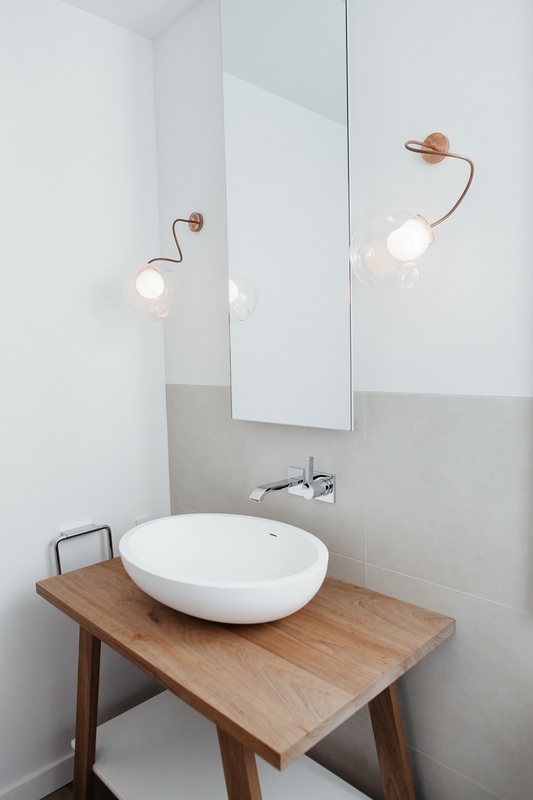 A sawhorse-inspired vanity and copper wall lights from Bocci in the MacDonald Park house powder room. There is a truism widely known amongst creatives that more often than not, poor design is what gets noticed. Typographer Erik Spiekermann may have explained the phenomenon best: “[It’s] like air, you only talk about it when it’s bad”. 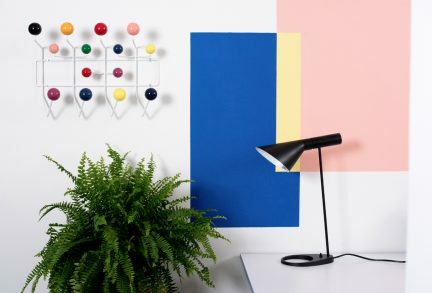 And while some may enter interiors designed by Falken Reynolds and give nary a thought to the men behind the mastery, the pair are outliers in this familiar scenario because the work is good, and that is why people are talking. 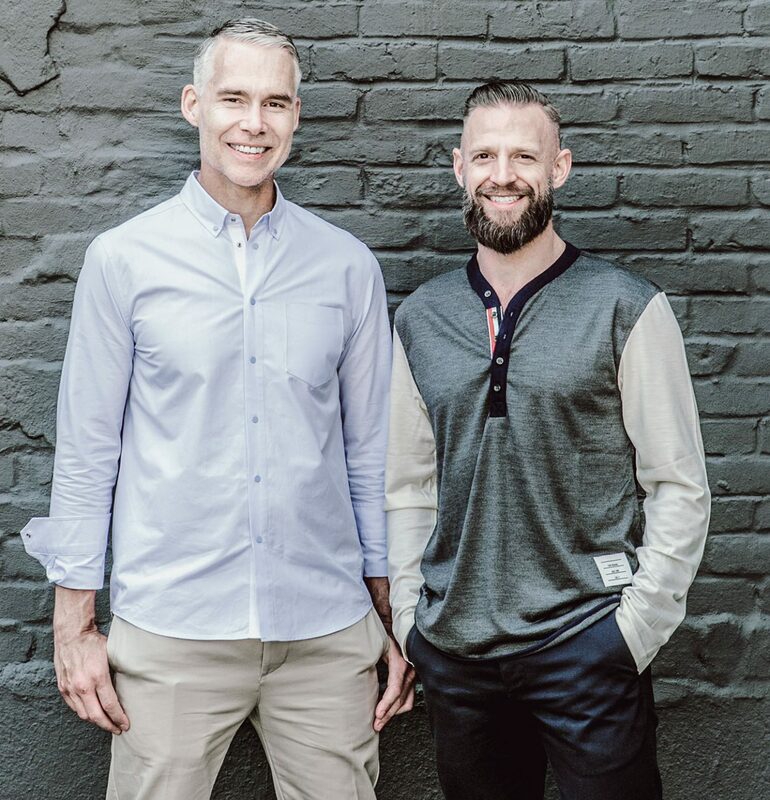 The chatter could also have something to do with the fact that Chad Falkenberg and Kelly Reynolds seek to design spaces that truly fulfill the needs of their clients—not the needs of their egos. This is exceptionally evident on a crisp autumn afternoon spent touring a recent residential project by MacDonald Park. 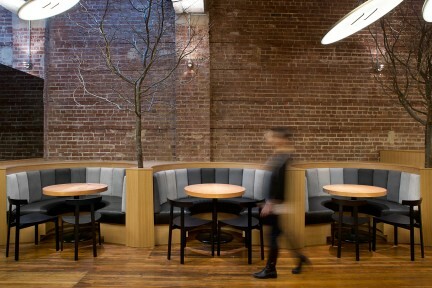 Dressed in the hallmark uniform of the Gastown resident (collared shirt; lace up boots; cuffed trousers), the soft spoken and stylish pair unassumingly divulge their winning design formula: clean lines plus extreme functionality and an unwavering willingness to create the right space equals a growing list of eager and satisfied clientele. “I love the idea of having a little bit of black in the cooking zone as a nod to fire and how we used to cook,” says Falkenberg of the kitchen’s cast iron stove-inspired black cupboards, backsplash, and countertop. 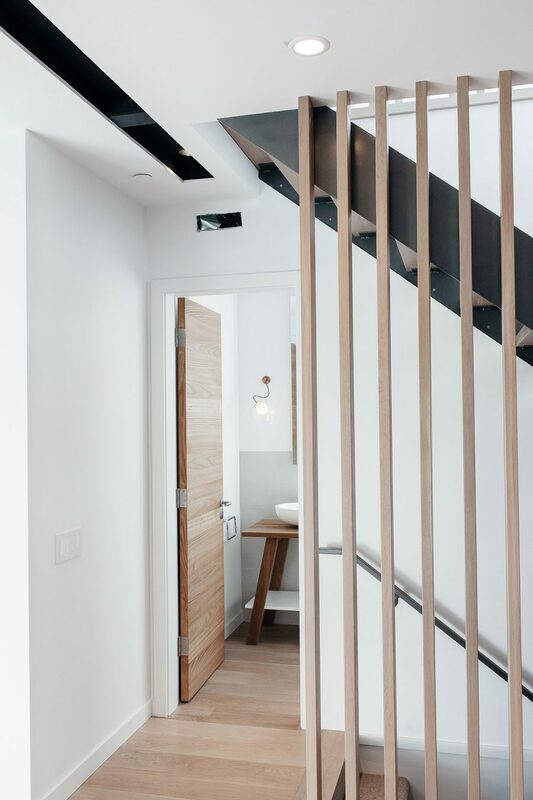 As the space is predominantly white, the contrast is refreshing, and the design choice is continued in a recessed lighting feature in the ceiling. 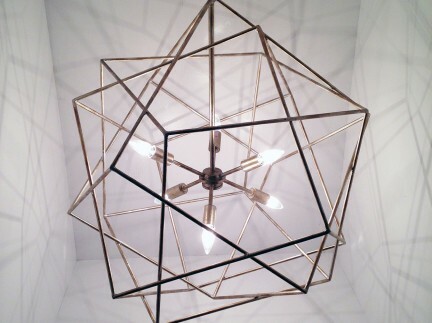 It leads the eye from the kitchen to the hall bathroom with a beveled mirror and glowing industrial light fixtures. 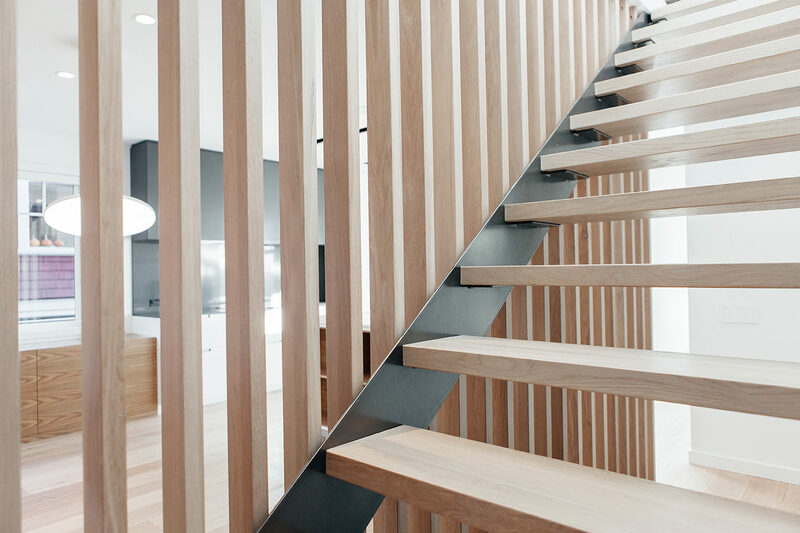 Also on the main floor, wooden slats encase a flight of stairs headed skyward, creating the illusion of a wall without detracting from the open concept floor plan. “When you walk in it’s almost opaque, so you don’t see the front door. There is still a sense of entry,” explains Falkenberg as he moves in tandem with Reynolds through the durable home designed for a growing family. This knack for knowing when to act has helped Falkenberg and Reynolds acquire a growing list of clients in search of their ideal home in addition to some notable commercial jobs. Eyewear company Bailey Nelson has made them even more popular with their neighbours; the pair count Rob Lo of Roden Gray, Niels and Nancy Bendtsen of Inform Interiors, and Josh Dunford of Burnkit amongst their most ardent supporters. “There’s a lot of awareness in how people want to live here,” adds Reynolds. “They know what they want and what they don’t want. 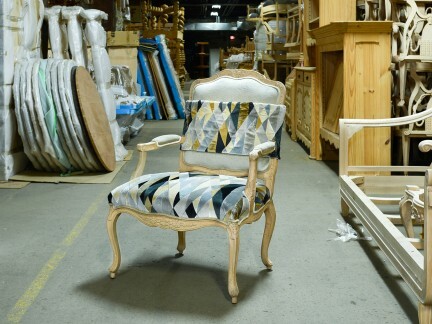 It’s easy to design for people here.” Thus far, the gentle men (and gentlemen) have been able to produce standalone interiors that let the contents and context of their circumstance spark conversation and still gain some well-deserved brand name notoriety. This is the delicate denouement of Falken Reynolds.